This year I got the 2nd price at the Fritz Pölking Nachwuchspreis of the GDT. This is actually my first international success. New Review online. Wildlife Photography with the car. For the moment only in German. I updated the review of the Sigma 500/4.5 EX HSM. I have added some images taken with the Soligor 1.7x TC. I started a BLOG. News and Infos around Wildlife Photography Sebastian Erras, can be found there. 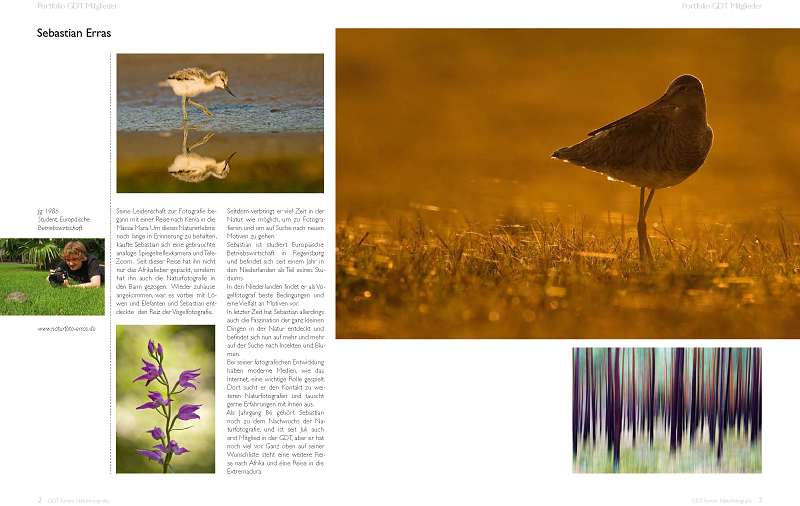 See my Members Portfolio in the German "Forum Naturfotografie" of the GDT. New website online. Check out the new layout and images in the Gallery and my Portfolio! My Blog is running now for over an year and if you would like to see the latest updates haver a look at it. This is the portfolio I entered into this category for young naturephotographers and got 2nd place.